The unofficial start to summer is finally here! That means the start of another fantastic beach season along Delaware’s coast. Before you start your weekend, make sure your bags are packed, plans are made and phone is charged to share your great experiences with friends and family using #Delagram. Every Delaware beach is unique and there’s bound to be one that fits your travel style. Whether you come to Delaware’s beaches with you friends, family or significant other, there is a beach to suit every taste. Delaware has a the family-friendly Rehoboth Beach, historical Lewes and the secluded state parks at Cape Henlopen and Delaware Seashore just to name a few. 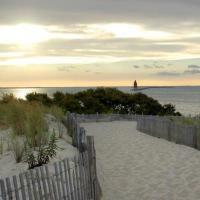 To learn more about Delaware’s beaches, visit the Beach Style Guide. Once you’ve chosen your beach, it’s time to look around to see what events are going on in the area. Visit Historic Lewes and browse local vendors’ offerings like fresh produce, eggs, fruits, baked goods, meats, fish, fresh-cut flowers and herbs. Plus, learn from local chefs, master gardeners and sustainable agriculture experts. Say “arrr” with the pirates that invade Bowers Beach once a year for a weekend of fun and games, plundering and pillaging, pirating and buccaneering. This family friendly event will include demonstration, pirate battles, cannon and musket firing, sword fighting, pirate costume contests for children and craft vendors, food, live period music and boat rides on Sunday. Join the celebration of Delaware’s horseshoe crabs and migrating shorebirds - natural wonders of the sea. Enjoy arts, crafts, boat rides, exhibits, games, music and great food. A shuttle bus will be available to transport visitors to and from the Wildlife Refuge. 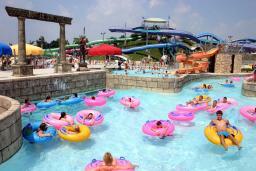 Enjoy giant slides, a 900-foot lazy river, wave pool and much more! Jungle Jim’s is located in Rehoboth Beach! Come swim in the refreshing Killens Pond Water Park with a mushroom fountain, floating lily pad fun walk, ground water jets and slides! Come out and hear the first live concert of the season at the Rehoboth Beach Bandstand. Sons of Pirates will be kicking off the season with their beachy-reggae style music. Even if you make a stop at Delaware’s beaches every summer, you’re bound to come across some of the new events and attractions added this year. Making your own feast instead of dining out? Try hosting a barbeque to take advantage of all the great additions Delaware can provide like fresh crabs, farm-fresh veggies and local brews. Take the scenic route! The Cape Water Taxi offers service Friday nights from Lewes to Dewey Beach. Plus, over Memorial Day Weekend you can experience sunset cruises. The Cape May-Lewes Ferry is a 90-minute scenic ride for travelers visiting the Delaware beaches from northern locations such as; New Jersey and New York. Vehicle and foot passengers can purchase tickets online or at the ferry terminal. If you’re a vehicle passenger, it is highly recommended to make a reservation. The Jolly Trolley Shuttle Service is a convenient way to travel between Rehoboth and Dewey Beach. Service begins Memorial Day weekend. The summer schedule offers daily service from 8:00 a.m. - 2:00 a.m. Rates are $3.00 one-way and $5.00 round trip. Use the DART First State’s Park and Ride lot located on Shuttle Rd. off of Delaware Rt. 1, north of Rehoboth Avenue to ride in comfort to the outlets, boardwalk and beach. All buses are air conditioned, equipped with wheelchair lifts and can carry 2 bikes. DART’s Route 305 Beach Connection, operates from Memorial Day weekend to Labor Day weekends and provides service from Wilmington to Rehoboth Beach on Friday – Sunday nights. In an effort to improve traveling conditions along MD 404, construction is currently underway. If you’re traveling from the Baltimore or DC area try 301 N to MD 304 E onto DE 10 E to DE-1 S to avoid any potential hold ups. Find directions from your departure location here. For more information about the 404 construction project, click here.